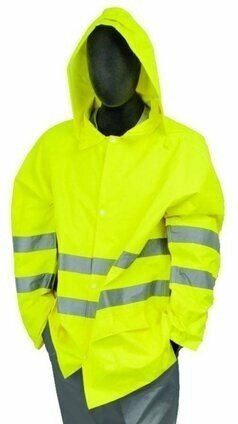 The Majestic 75-1351/1352 Hi Vis Rain Jacket is 100% polyester, PU coated oxford fabric. All seams are fully taped to insure waterproof integrity. Jacket has two outer pockets and hood. Unlined. Available in Hi Vis Yellow and Hi Vis Orange. Meets ANSI / ISEA 107-2010 Class 3 standard. Available as a set with matching pants here.